Star Trek: Deep Space Nine debuted in January 1993 and ran for seven seasons and 176 episodes. In time, Deep Space Nine became the 'least Star Trek-like' of the six series, more interested in long story arcs about war and political intrigue than boldly exploring new worlds. However, these early episodes saw the series initially hamstrung by a more traditional approach and episodic structure. Deep Space Nine opens in 2369. The Cardassian Union has withdrawn its occupation forces from the planet Bajor, leaving its infrastructure shattered and its populace in need of help. The United Federation of Planets assists with the planet's reconstruction efforts as a prelude to Bajor joining its membership, and Starfleet takes command of the former Cardassian orbital facility, Terok Nor, now renamed as Deep Space Nine. Initially it appears that the Federation's role, although important, is somewhat unexciting. However, a stable wormhole is discovered linking the Bajoran system to the Gamma Quadrant, located seventy thousand light-years away on the far side of the Galaxy. As dozens of races clamour for the opportunity to explore this new frontier, Bajor becomes enriched by the wormhole's presence and the Cardassians begin scheming to retake the station and Bajor, with only the thin red line of Starfleet's small presence to stand against them. As the series evolved this initial premise gradually shifted and eventually was discarded altogether. But these early episodes are driven by this backstory. Bajor's politics and religious strife becomes a dominant force in the early series, to the bemusement of the audience. Although Bajor is a very well-developed culture and world (arguably the most well-developed planet ever created in Star Trek's history), the Bajorans are not one of the more colourful races in the Trek canon. Unfortunately, when not dealing with Bajor and its problems the series tends instead to recycle old Trek ideas, plots and characters. It's not long before characters such as Q, Vash, Lursa and B'Etor from The Next Generation are making cameo appearances which are vaguely amusing but don't really seem to help the show establish its own identity. The series is also not helped by a somewhat stiff performance from Avery Brooks as Commander Sisko, although he gradually relaxes into the role as the series progresses. However, the first season of each incarnation of Star Trek is traditionally a pretty rough time as actors and writers find their feet. Compared to the first seasons of both The Next Generation and Voyager, Deep Space Nine's first year is actually pretty good. The pilot sets things up reasonably well (kicking off with a spectacular flashback to the Battle of Wolf 359 between the Borg and forty Federation starships) and subsequent episodes explore each of the main characters and the setting in turn. There's some ropey acting and a few of the effects have not aged well, but otherwise everything stands up. In fact, considering DS9's story arc was made up as the writers went along rather than being pre-planned in advance it's surprising how cohesive the series is and how many elements are set up in the first few episodes that reach fruition at the end of the seventh year. And, naturally, DS9 at its worst is still more than a match for Voyager at its best. The stand-out episodes from the first season are probably the last two: Duet, a powerful two-hander which pitches Nana Visitor's Major Kira against guest star Harris Yulin as a Cardassian war criminal accused of murder and complicity in genoicde; and In the Hands of the Prophets, which sees a destabilised Bajor descending into political and religious strife which endangers the station. Season 2 sees the writers and producers taking a different tack. Existing Trek elements are downplayed, TNG cameos and recurring characters are dramatically reduced and the show starts building its own mythology. New characters and factions are introduced. The characters of Bareil and Winn, who represent the two different ideologies battling for control of Bajor, are developed, whilst 'simple tailor' Garak evolves into the most multi-layered character in Star Trek's history. The Maquis - a terrorist group made up of disaffected Federation citizens who turn to violence to protect themselves after their planets are given to the Cardassians as part of a treaty - muddy the waters of our heroes' allegiances quite a lot. Early in the season we hear a whisper about something called 'the Dominion', which controls some of the Gamma Quadrant and as the season progresses we start to see some of their handiwork in the form of planets devastated by their actions and entire races displaced because they had nothing to give the Dominion. This latter plotline culminates in the impressively foreboding finale, The Jem'Hadar, in which the Federation is faced with a powerful new enemy and suffers a hefty defeat which leaves things on an ominous note going into Season 3. Deep Space Nine Season 1 (***) is a bit rough around the edges and at times clings a bit too readily to existing Star Trek cliches, but there's a huge amount of potential on display here and most episodes have something interesting to offer. The series is available on DVD in the USA and UK. 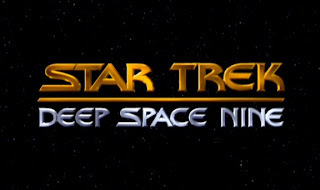 Deep Space Nine Season 2 (***½) is stronger, introducing new concepts, ideas and characters which give the series much more of its own distinctive identity, complete with the introduction of Trek's most fascinating enemy since the Borg. The series is available on DVD in the USA and UK. Wert, would love to see a review of TNG here.